By Xah Lee. Date: 2018-04-10 . Last updated: 2018-07-09 . This came out in 2018-05, and is one of the best trackball. Buy Deft Pro Trackball Model number M-DPT1MRXBK. Can be used wired, wireless, or bluetooth. It's rechargeable. Just connect the USB cable to charge. 8 buttons. 3 on top. 3 on thumb area. and counting scroll wheel tilt as 2. The left click button is actually on the thumb. The button under thumb is the left button. It uses modern (2018) tracking tech. So, not like many trackballs that's using 10 years old optics that's super slow. This trackball, has the most smooth ball of all trackballs under $150. It's good. Good reviews on amazon. The only thing is, you need their software to program the buttons. On linux, the buttons fn1 fn2 fn3 would be dead. I'd rate this or the Logitech MX Ergo Trackball as best trackballs. Elecom is a Japanese company. 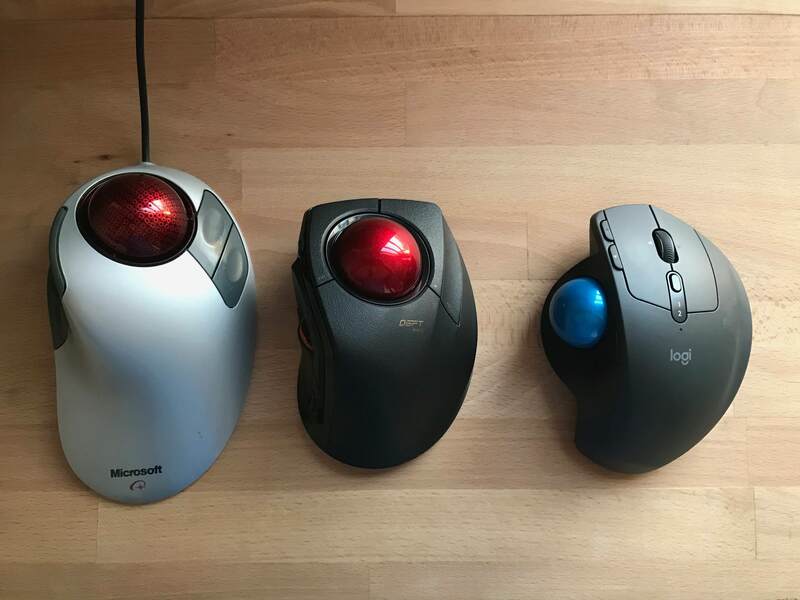 They make many trackballs. Here's comparison of the index finger trakball series.